Greetings readers! As promised, I have some more sight word sentence printables for you! Today I am sharing First Grade Sight Word Sentence worksheets. Each one has the word along with a funny sentence. Students will practice tracing the word, reading the word, then writing it on their own. Students will also cut out the letters and spell the word correctly to complete their sentence, great for fine-motor skills and spelling practice! Next they will write the word to complete the sentence. Finally they will make up their own sentence using their newly learned sight word! The repetition along with the variety of activities really helps students remember their sight words! This download includes 41 First grade level sight words from the Dolch sight word list. What program did you use to create the worksheets? I would love to make some. I love these! Really a great idea and so well layed out! Can’t wait to use them with my first grader! Thank you! Your designs are so cute! I wish you would have been around when my kids were little. Yes, the caterpillars and worksheets are the same. The pre-primer level and Kindergarten 1 are the same, then primer and Kindergarten 2 match, then first and first. Hi, sorry to be the one to point this out but there are two typos on the sheets. For the word ‘from’ and ‘take’ the tracing words are different! Thank you for the sight word worksheets they are wonderful. I teach Kindergarten and my students love them. 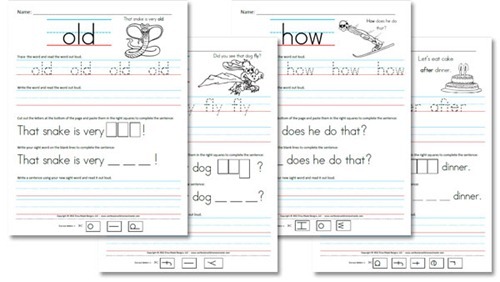 I wanted to know have your done any more sight worksheets like Fry’s 100 sight words or how can you edit/create your own. 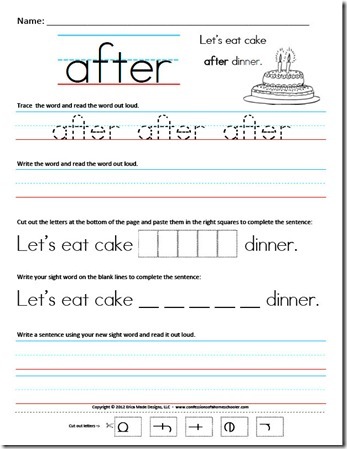 Thank you so much for these great worksheets. I’ve been homeschooling my 11yr old son, who is living with Autism, for about 7 months now, and on days that I’m just so wiped out and exhausted these worksheets are fantastic exercises for him. Really wonderful work, Thanks!